I love the new food trend I see going on with Nourish Bowls because they are healthy, delicious food prepared in a visually appealing way that makes them even more fun to eat and to serve. According to Nutrition Stripped, “The root of the nourish bowl is choosing nutrient-dense veggies, fruits/carbohydrates, healthy fats, and quality proteins to make a filling meal in a bowl.” Well, when I saw this amazing sweet potato nourish bowl recipe from Chungah Rhee’s upcoming Damned Delicious Meal Prep book (affiliate link below), I was eager to share it with my readers (permission was granted) that might want to try some nourish bowl recipes at home. This meal prep book will teach readers exactly how to incorporate the Meal Prep lifestyle to lose weight, regain energy, reboot eating habits, and to find the perfect balance. 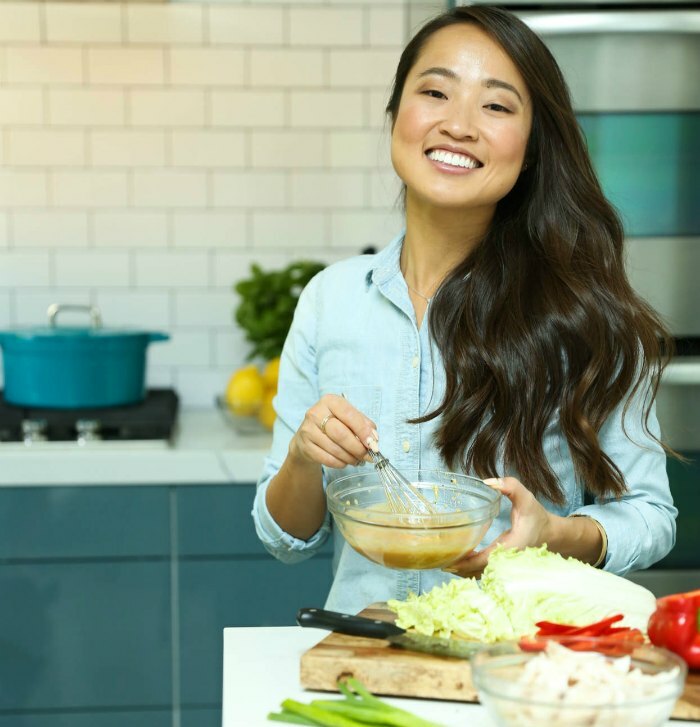 I love how her Meal Prep combines the best of bulk cooking, slow cooking, and pressure cooking so that you can always have healthy, delicious food on hand. Excerpted from DAMN DELICIOUS MEAL PREP: 115 Easy Recipes for Low-Calorie, High-Energy Living. Copyright © 2019 by Chungah Rhee. Reprinted with permission of Grand Central Publishing. All rights reserved. So, what I really love about this bowl is that it repurposes so many ingredients from the other recipes in this book. You should have leftover farro, kale, and cabbage from the Thai Chicken Buddha Bowls (page 113), and you can use the crispy garbanzo beans from the Kale Chips Snack Box (page 175). And if you’ve made the Stuffed Sweet Potatoes—4 Ways (page 150), you should have an abundance of sweet potatoes around. So, there you go. I just took care of 87 percent of the ingredient list right there. Now, we have a glowing nourish bowl with basically only two or three ingredients you may actually need. So there’s no excuses not to make this, right? 1.Preheat the oven to 400 degrees F. Line a baking sheet with parchment paper. 2.Place the sweet potatoes on the prepared baking sheet. Add 11⁄2 tablespoons of the olive oil and the paprika, season withsalt and pepper, and gently toss to combine. Arrange in a single layer and bake for 20 to 25 minutes, turning once, until easily pierced with a fork. 3.Cook the farro according to package instructions; set aside. 4.Combine the kale, lemon juice, and the remaining11⁄2 tablespoons olive oil in a medium bowl. Massage the kale until well combined and season with salt and pepper to taste. 5.Divide farro into meal prep containers. Top with sweet potatoes, cabbage, tomatoes, and crispy garbanzos. Refrigerate for up to 3 days. Serve with the avocado. * Cut avocado will turn brown when exposed to air, so either prep the avocado just before serving, or brush olive oil or lime or lemon juice over it before placing in the meal prep container. You can get the Damn Delicious Meal Prep book at your local bookstore or on Amazon. A glowing, healthy nourish bowl that will taste as good as it looks. Place the sweet potatoes on the prepared baking sheet. Add 11⁄2 tablespoons of the olive oil and the paprika, season withsalt and pepper, and gently toss to combine. Arrange in a single layer and bake for 20 to 25 minutes, turning once, until easily pierced with a fork. Cook the farro according to package instructions; set aside. Combine the kale, lemon juice, and the remaining11⁄2 tablespoons olive oil in a medium bowl. Massage the kale until well combined and season with salt and pepper to taste. Divide farro into meal prep containers. Top with sweet potatoes, cabbage, tomatoes, and crispy garbanzos. Refrigerate for up to 3 days. Serve with the avocado. 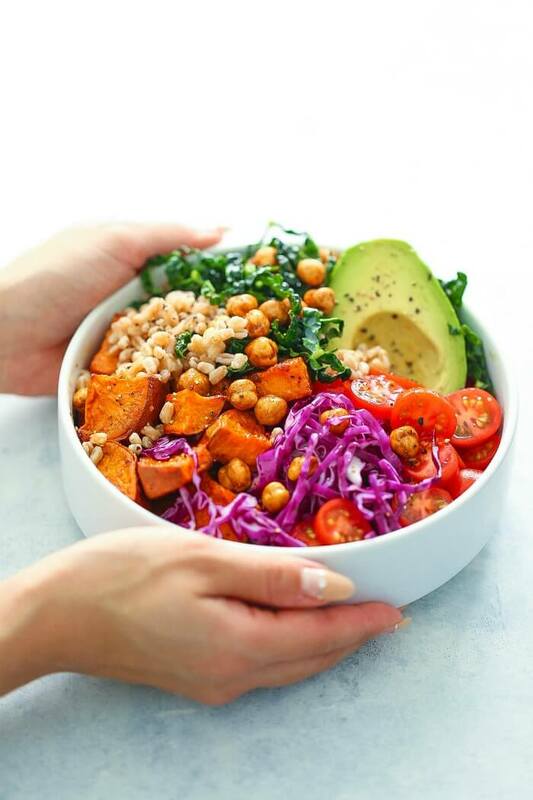 Do you think you try this sweet potato nourish bowl recipe? Let us know what you think @familyfocusblog and @damn_delicious! Scarlet this looks delicious, wholesome and quite filling, too. The colours in this bowl are just gorgeous! They might even be pretty enough to get picky kids to try it.